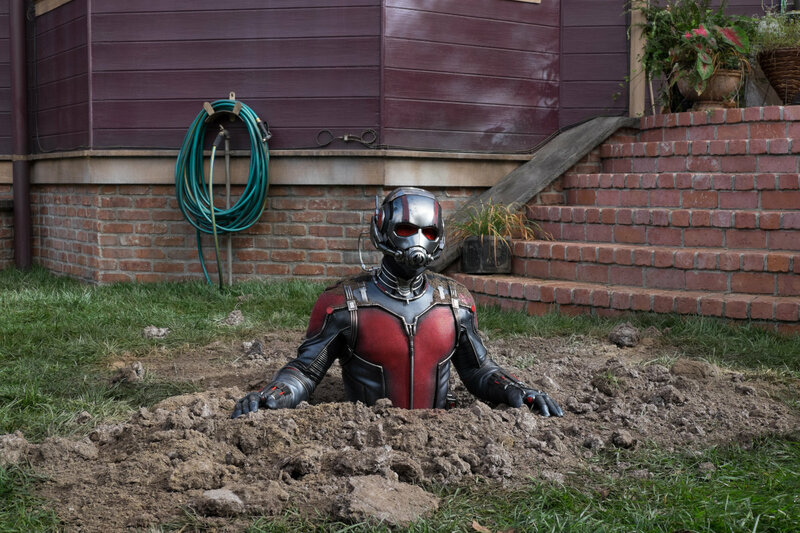 There are lots of ants in “Ant-Man.” More than I ever thought. Because Ant-Man doesn’t just shrink down to the size of an ant but he also controls them with his thoughts. Thank goodness the only spider in Spider-Man is the one that bites Peter Parker, otherwise it would be scarier than “Arachnophobia.” Thankfully, I’m not that afraid of ants. The premise of the little known Ant-Man character is silly to be sure, but it also works tremendously well onscreen mostly because of star Paul Rudd’s endless likability and director Peyton Reed’s firm comedic grasp of the material. “Ant-Man,” written essentially as a comedic heist film, is probably one of Marvel’s funniest films, and probably one of its weirdest. It’s certainly not quite as successful as last summer’s surprise hit “Guardians of the Galaxy” but it fits nicely into the Marvel Cinematic Universe even if it’s a smaller scale adventure with less ambition than its older, more popular brothers Iron Man and Captain America. Paul Rudd is perfectly cast as cat burglar Scott Lang, though I have no idea if the comic character Scott Lang was ever described as a Paul Rudd-type. Lang, is just being released from prison and is determined to make amends with his young daughter and ex-wife. Soon after his release he’s recruited by scientist Hank Pym (Michael Douglas) to help with a heist involving the protection of a powerful shrinking formula (shades of “Honey, I Shrunk the Kids” are to be expected). The film functions as an origin story, showing how Lang is introduced to a special suit that can shrink to the size of an insect and grow back within seconds which gives him super strength. He also becomes ruler of the ants by communicating with the bugs through telepathy. It’s a premise you either go with or you don’t, if you can make it through any of the other eleven Marvel films you’re bound to at least enjoy this one. The real strength of “Ant-Man,” in an age where superhero films are as consistent as the rising sun, is the reliance of humor to tell its story. Rudd is paired up with his prison pal Luis played by Michael Pena who provides outstanding comic relief. So much of their dialogue feels improvised I’m not shocked to see Rudd’s name listed as one of the film’s four screenwriters. Though it’s interesting to wonder how much of original director Edgar Wright’s script was left intact. Corey Stoll is also a highlight as a former apprentice of Pym’s who eventually becomes the villainous Yellowjacket. He spends a lot of the movie turning people that cross him and test animals into tiny gobs of snot with his own not-quite-perfected shrinking technology. Evangeline Lilly is also actually quite good as Pym’s daughter Hope and a potential love interest for Scott. All of the actors are solid and well-cast. Trailer for Ant-Man on TrailerAddict.